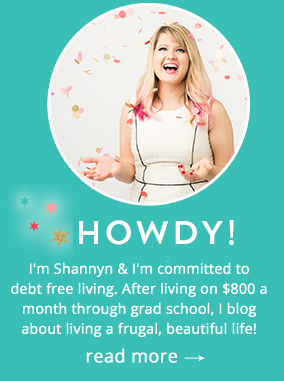 If you’ve been following Frugal Beautiful for any length of time, you know how I love to get my DIY on. I find crafting and creating to be super therapeutic and fulfilling. But being a thrifty, frugal gal, I always have my mind on the bottom line before starting a project. Otherwise, one can easily fall into a spending black hole…. 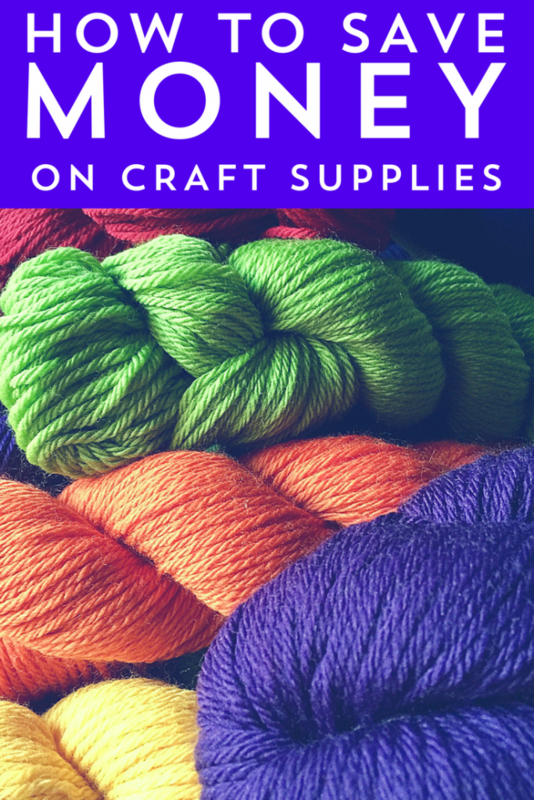 While there are many ways to save money on craft supplies, some more extreme than others, the following have always worked for me. Thrift stores have always been a goldmine for me when it comes to finding craft supplies. This is especially true for yarn and fabric. Plus, don’t forget to think outside the box! For example, check out the linens section for beautiful, vintage fabrics. And look through the glassware and household sections for items that can be re-purposed into decor and storage. I love making simple block quilts but I HATE cutting the quilt squares. Luckily, eBay has a gigantic variety of affordable fabrics, notions, buttons, and yes, quilt squares. My favorite part about buying on eBay for my quilts is that I can generally find options made with a wide variety of older, vintage prints. Therefore, my quilts end up being way more unique than if I purchased the fabric from my local store. 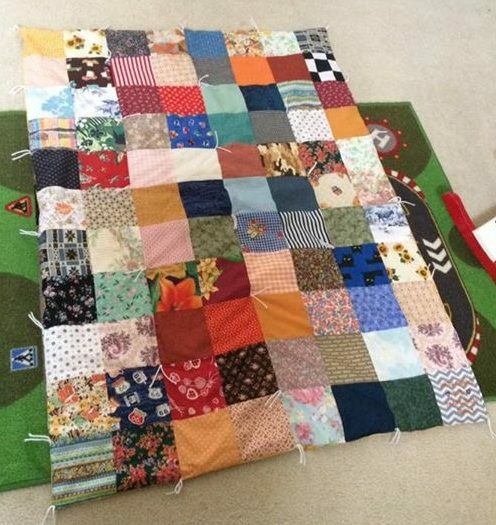 One of my eBay quilts. Did you know that the three most popular craft stores – Joann, Michaels, and Hobby Lobby – offer some super high-value coupons? They sure do! Here’s how to grab them….. Text – Text BEADS to 56266 to join. I can’t tell you how many craft supplies I’ve scored at garage sales. It seems like everyone likes to start projects, but many just don’t finish them. These supplies then often get thrown into the cheap or free bin at garage sales, which means epic deals for you and me. If purchasing a craft kit, just be sure to go through it before buying to make sure all the supplies you need are still there. Reusing and recycling items can be a good way to save money on craft supplies. Granted, sometimes you just have to buy new, but you can make a lot of neat things out of used sweaters, sheets, pieces of wood, storage items, etc. Some of the neatest items on Etsy are reused and reclaimed, so what does that tell you? How many times have you been waiting in line at Joann or Michaels and you come across an amazing looking crafting book, just begging you to buy it? They do that on purpose, because they know how many of us find them irrestible. Next time that happens, snap a pic of the cover or write down the name and then see if you can rent it at your local library. If not, check Amazon or Better World Books to see if it is available used. If you have zero luck with these options, go back with a coupon in hand (see above) and purchase it then. Before the age of the internet, the only way you could purchase patterns was at your local fabric store. If you wanted to use multiple sizes of the pattern, that meant sketching them out onto paper. Now, you can find almost any pattern for just about any item, online. Because you print it yourself, you can print as many sizes you need. It is so much easier. Better yet, many patterns are free. Just google “Free pattern download (item name).” Otherwise, check out Etsy for some cheap pattern downloads. 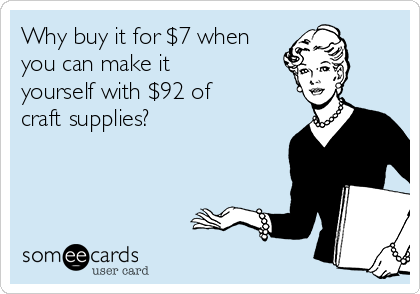 Where do you save money on craft supplies? Comment below! Have you tried Craftoutlet they have Deco Mesh half the price of Hobby Lobby and bigger rolls. Also ribbon, signs and much much more. Only thing bad is the minimum amount to get free shipping. But, if you’d stocking up good place to buy.